This entry was posted on September 3, 2017 at 7:52 pm and is filed under Albuquerque, Cooking, Holidays, In the neighborhood. You can follow any responses to this entry through the RSS 2.0 feed. You can leave a response, or trackback from your own site. Good on you and Herself! Neighbors with gardens? Hard to go wrong there. Seems your backyard is ripe for a garden next year. Don’t want to dig? Stock tanks, buddy. We are thinking about some ourselves next year. Left ours with the old house for the buyers. Pat, we might have to do ‘er. These tomatoes are unreal. Almost purple they’re so red, and meaty as a ribeye. The dinner recipe sounds and looks good, will have to give it a chance. The smoke in the Bozeman MT area is horrible! No biking for a week plus! Bad stuff up there, Charley. The Missoulian has a fire roundup that’s enough to give anyone The Fear. Got your asbestos undies on? Our old riding buddies live in Bozeman now. They are telling us the same thing. It’s a mess. 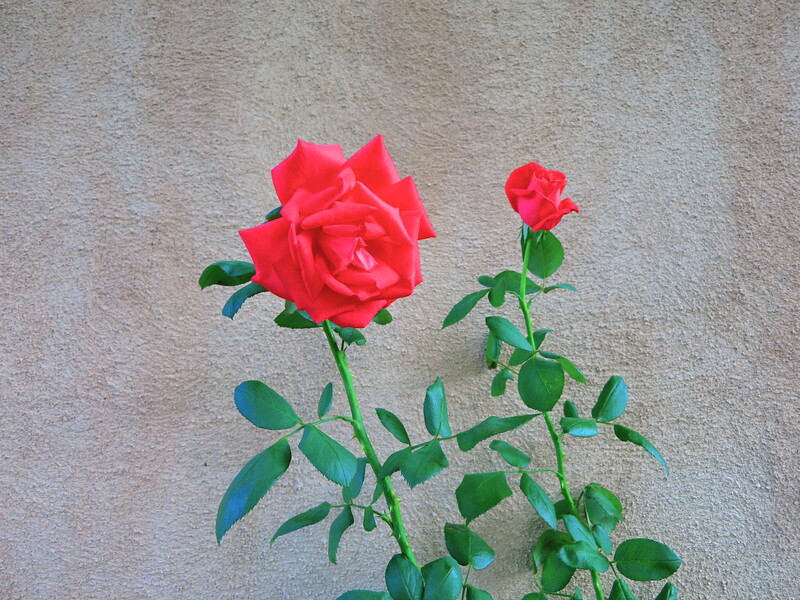 A second blooming of roses – great! Glad you’re having a successful and welcome 4-day weekend. Check out Union banners; the artist, Ralph Fasanella and many other subjects. Cool stuff, Libby … thanks for passing it along. I wish I’d saved my old copies of The Call/El Clarin, the old October League paper. Great rabble-rousing stuff in there. Wow, that sounds like a great weekend. Better than what wife and I were up to: glued to the media to see if we needed to evacuate from the path of the La Tuna fire here in Tujunga. In the end, we got to stay put. No power for 6 hours though, wow. Today is cooler and breezy and is a nice day. Took the ’93 Bridgestone MB-4 to survey the damage up among the fire roads. Lot’s of black and soot and ash for miles around. I’ll give it till the end of January till it starts sprouting green again. That fire looked like a lulu, man. The ones up in western Montana and Oregon likewise. Stay safe out there, folks. Smoke heavy here in the Bibleburg environs from the Oregon/CA/Montana fires. Makes the ragweed sniffles feel positively benign. Should clear a bit tonight as a cool front moves through. My man Hal up Weirdcliffe way reports samey same. Plus rain. We just have wind and snotlocker issues down here. Faugh, hyeeenk, snerk, hocccccck, ptui, etc.